Kit lenses are suitable for a wide range of subjects but, alas, portraiture isn’t one of them. With a widest available aperture of f/5.6 at the long end of the zoom range, they simply can’t give you the tight depth of field that you really need for portraits, where you typically want to blur the background and make the person you’re shooting really stand out. The best solution to this is to add a fast prime lens to your DSLR outfit. For FX (full-frame) cameras, the classic focal length of 85mm enables you to shoot head-and-shoulders or half-length portraits from a natural distance, without invading your subject’s personal space. If, however, you’re using a DX-format camera with a 1.5x crop factor, a 50mm lens will give you a similar effective focal length of 75mm. There are a variety of 50mm and 85mm portrait-friendly prime lenses on the market, typically with a widest aperture of f/1.8 or f/1.4. Compared with the f/5.6 aperture of a standard zoom, these have an aperture rating that’s 3.33-4 stops faster, respectively. Faster shutter speeds can be a bonus, especially for indoor portraiture or when putting your subject in the shade to avoid the glare of the sun, but it’s the tighter depth of field offered by wide apertures that’s their main attraction. From a budget point of view, f/1.4 lenses are typically more expensive than their f/1.8 counterparts. In order to let in more light, the forward elements in a faster lens need to have a larger diameter, so faster lenses are bigger and more expensive to manufacture. However, the quality of glass and construction can still be just as good in slower lenses, or maybe even better. The two Tamron lenses on test aim to keep size and weight to easily manageable levels with a modest f/1.8 aperture rating, while also adding optical stabilisation, which is practically unheard of in portrait prime lenses. Taking top spot is the Tamron SP 85mm f/1.8 Di VC USD. It's small and light, which makes it manageable when shooting handheld, and it also has the bonus of Tamron’s highly effective Vibration Compensation system. It also happens to be very reasonably priced indeed. Despite its much longer focal length, the big brother to the Tamron SP 45mm f/1.8 Di VC USD is actually a fraction shorter, and has the same 67mm filter thread. It also shares the same combination of an f/1.8 aperture rating and VC image stabilisation, while the styling, build quality and weather seals are also the same. At 660g the 85mm lens is heavier as it features 13 elements, compared with just 10 in the 45mm. Both XLD (eXtra Low Dispersion) and LD elements are included to reduce aberrations, and two types of nano structure coatings are included to combat ghosting and flare. Bokeh is even smoother than in the Tamron 45mm lens, but coma is a little more noticeable at apertures wider than f/2.8. Centre sharpness is impressive when shooting wide open, but it’s also excellent right out to the extreme corners of the frame. If you want to take advantage of prime lens image quality at medium aperture settings, stabilisation can be a real help – hence the inclusion of Tamron’s Vibration Compensation (VC) system in this lens. The modest f/1.8 aperture rating in this ‘standard’ prime helps keep the size down and the weight off, and the lens is nicely engineered, with premium build quality and weather seals. At 45mm, the focal length is a touch shorter than the more standard 50mm. This equates to 67.5mm on a DX-format body, though the lens is also full-frame compatible. Autofocus isn’t superfast, but it was highly accurate in our tests. The stabiliser gives a benefit of about four f/stops, and manual focusing benefits from greater travel in the focus ring than with the other lenses on test. Sharpness is excellent, even when shooting wide open, while bokeh is impressively smooth, both at f/1.8 and when stopping down. This Art lens from Sigma’s Global Vision line-up is a heavyweight contender, one that’s almost twice the length and three times the weight of Nikon’s competing 50mm f/1.4 lens. It’s full-frame compatible, but undeniably hefty for a portrait lens on lightweight DX format bodies such as the D5500, tipping the scales at 815g. The relatively complex design incorporates 13 optical elements in all, including an aspherical element and three SLD (Special Low Dispersion) elements. Construction feels reassuringly robust, but this is the only lens on test that lacks a weather seal on its mounting plate. An upside of the large front element is that vignetting is comparatively minimal here. Bokeh is deliciously creamy at f/1.4 and remains of exceptional quality even when stopping down a little. This is helped by a well-rounded aperture, based on nine diaphragm blades. Given that its 50mm sibling was unveiled three years ago (at the time of writing), Sigma’s recently-unveiled 85mm f/1.4 Art lens has been a long time coming. So, has it been worth the wait? It certainly feels the part; at 1130g, it’s nearly twice as heavy as the Nikon AF-S 85mm f/1.4G. To put that into perspective, that makes it only 300g lighter than Nikon’s new 70-200mm f/2.8E VR! Like Tamron’s 85mm, this optic features an electromagnetically controlled diaphragm for greater accuracy in high-speed continuous mode. And, unlike its 50mm sibling, it also features weather seals. Autofocus is extremely fast and accurate, and image quality is excellent, with a wonderfully soft and creamy bokeh, although the lens isn’t as sharp as some of its rivals. Colour fringing, coma, distortion, ghosting and flare are all negligible. All in all, the Sigma 85mm packs a heavyweight punch that’s in keeping with its construction. Read more: Sigma Interview: "Shifting our brand to a more premium range was definitely a good move"
Like the AF-S 50mm f/1.8G (below), this is the smallest and lightest lens in its class, measuring just 80mm long and weighing a modest 350g. Build quality feels much the same, too, down to the weather-sealed mounting plate, and the inclusion of a single aspherical element. 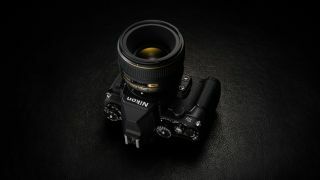 Autofocus is faster than in the both of Nikon’s 50mm lenses, thanks in part to the fact that it involves the movement of the smaller rear elements, rather than the larger front ones. This lens is superbly sharp, even shooting wide open, although naturally the aperture doesn’t go as wide as in the f/1.4 lenses. Vignetting is more noticeable than in the bigger Nikon 85mm f/1.4 lens and, while bokeh is beautifully soft, stopping down gives specular highlights a heptagonal appearance – a consequence of the diaphragm having seven rather than nine blades. This AF-S optic is much newer than the AF-D version, and features a ring-type ultrasonic autofocus system that works on any Nikon body. Though only slightly smaller than the f/1.4 version, it’s 50 per cent lighter, but build quality feels pretty good, right down to the weather-sealed metal mounting plate. Optical finery includes an aspherical element. The front element is deeply recessed, especially at longer focus distances. As with the f/1.4 version, AF speed is a little pedestrian, but sharpness and contrast are impressive, even at wide apertures. Defocused points of light take on a visible geometric shape at smaller apertures, as the seven-blade diaphragm isn’t that well rounded. Barrel distortion is also a little worse than with the other lenses on test, but this is much reduced when the lens is used on a DX body. It’s the most upmarket option in Nikon’s 50mm line-up and remarkably compact for a 50mm f/1.4, being only 1.5mm longer and wider than the f/1.8 version, and with the same diameter filter thread of 58mm. Furthermore, while it's noticeably heavier than the f/1.8 version, it’s just a third of the weight of the Sigma 50mm f/1.4 A. It feels similar to the f/1.8 in terms of build quality and handling, but with an additional optical element, plus two extra iris blades, the aperture is more rounded when stopping down. Even so, bokeh isn’t altogether pleasing when shooting wide open, as bokeh fringing and coma are quite visible. However, contrast and sharpness are impressive, vignetting is fairly minimal, and bokeh becomes much smoother when stopping down to f/1.8, beating the Nikon 50mm f/1.8G at the same aperture. Nikon’s 85mm lens is relatively compact and lightweight. Even so, it boasts a fast f/1.4 aperture and plenty of upmarket finery: for example, it’s the only Nikon lens on test to feature Nano Crystal Coatings and, unlike both of Nikon’s f/1.8 lenses, it has a nine-blade diaphragm for more rounded apertures. It features just 10 optical elements, which is only one more than in the much less expensive Nikon 85mm f/1.8 lens, but the forward elements are considerably larger, and the filter thread is bumped up from 67mm to 77mm. Build quality is of a fully pro standard, though. Although it drops off a little at f/1.4, sharpness is impressive throughout the rest of the aperture range. Even so, it’s mostly matched by Nikon’s much cheaper 85mm f/1.8 lens. Colour fringing, meanwhile, proved slightly worse than in the f/1.8, while coma was about the same. However, vignetting was less noticeable, and bokeh was better when stopping down.